September MLS® results conclude a very impressive third quarter where all the additional listings were capturing buyers’ attention. Dollar volume for the third quarter alone was less than $42 million away from reaching the $1 billion mark, well ahead of previous third quarters. Sales as well top out as best ever for this three month period. With leading edge technology available and an extremely active and co-operative network of nearly 1,700 REALTORS® adopting and embracing it, it should not come as much of a surprise that there is less seasonal divergence in monthly sales and listing activity. Being away from the office or workplace does not prevent an agent from keeping on top of a listing or sales transaction. September MLS® unit sales increased 8% (1,123/1,040) while dollar volume rose 11% ($278.8 million/$251.4 million) in comparison to the same month last year. Year-to-date MLS® unit sales are down less than 2% (10,234/10,427) while dollar volume is up 3% ($2.64 billion/$2.55 billion) in comparison to the same period in 2012. 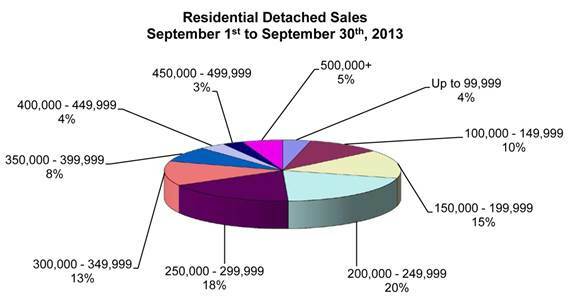 The active MLS® listings or inventory at the end of September is sitting at 4,249, a 22% increase over 2012. Despite the 58% increase in the condominium inventory and a 24% jump in residential-detached properties at the end of September compared to the same time last year, both respective property types are not seeing a real significant change in how many days they are staying on the market. Condominium listings at the end of September were on the market an average of 67 days compared to 63 in 2012 while residential-detached went down from 55 days in 2012 to 53 days this year. Residential-detached listings priced over $600,000 have been on the market on average the longest at 68 days (77days last year). Inventory in the higher priced condo ranges is considerably reduced so the average numbers can be quite distorted given there is not enough of a sample size to make a reasonable assessment. The busiest residential-detached price range in September was the $200,000 to $249,999 price range at 20% of total sales with the next higher price range from $250,000 to $299,999 not far behind at 18%. The highest sale price was $1,340,000 while the lowest sale price was only $11,500. The average days on market for residential-detached sales in September was 31 days, 3 days slower than last month and 4 days off the pace set in September 2012. For the first time, condominium sales in the $200,000 to $249,999 price range challenged the previous long standing dominance of the $150,000 to $199,999 price range for highest sales numbers. The latter still prevailed at 31% of total sales but the former was a close second at 28%. The average days on market for condominium sales in September was 31 days, 4 days quicker than last month and the same time as September 2012.